The NJC’s book club meets monthly and is organised Tony Sanderson, who writes this week’s post. AT THE CIRCLE CAFE BOOK CLUB we provide a relaxed and friendly environment where people can both chat about a book we have been reading together or about anything we like. Some have just enjoyed spending the evening with us. Light refreshments are available. We have been reading Hard Times by Charles Dickens. This is the only one of Dickens’ novels to be set in the North of England and it highlights the enormous gulf between the rich and the poor of the Industrial Revolution of the 1800s. This parallels the rise of the super rich in our day, in which ordinary people are suffering under austerity measures. 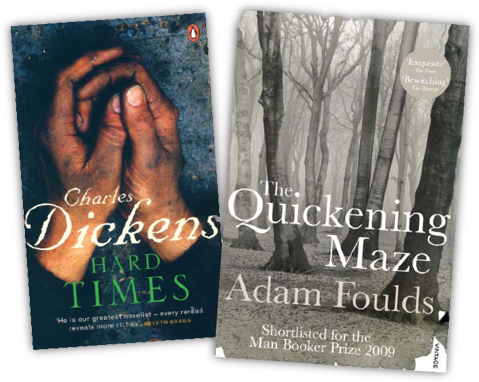 It is in Hard Times, set in fictitious Coketown, that the social and moral purpose of Dickens’ work is most evident. Openly ironic and satirical in its tone, Dickens savages the concept of human beings as being merely workers. Our next book which will be available at the Book Club will be The Quickening Maze by Adam Foulds. Shortlisted for the Man Booker Prize in 2009 it is the first of two books we are reading about Northamptonshire’s famous poet John Clare. After a lifetime’s struggle with alcohol, critical neglect and depression, in 1840 the nature poet John Clare is incarcerated. The asylum, in London’s Epping Forest, is run on the reformist principles of occupational therapy. At the same time, the young Alfred Tennyson, moves nearby and becomes entangled in the life of the asylum. This historically accurate and intensely lyrical novel describes the asylum’s closed world and Nature’s paradise outside the walls: Clare’s dream of home, of redemption, of escape. If you would like to borrow a copy of either book to read contact Tony Sanderson on 07740 853105. The next Circle Café Book Club is on Friday 31st Aug, 2012 from 7.30pm in the Northampton Jesus Centre’s Circle Café.